Fantastic! I'm glad you put the gallery up. 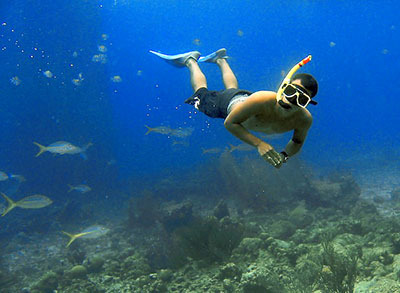 It's a cold Sunday here in Pittsburgh, and thinking about snorkeling in the Caribbean has warmed it up a little. I'm headed over to the Geek Cruise website now to find something for next year. Thanks for the great tips for underwater photography. I have always used a "disposable" camera for fear of destroying my camera with water. Have you ever accidentally wrecked a camera despite these best efforts? Loved your pictures! Thanks for sharing them. Your memory card is at the PO in Santa Rosa, ready to be picked up. I appreciate your willingness to share it with me. good information! would any of your readers be interested in, a professional, quality, DIVERS FLASHLIGHT ? fantastic post!! would any of your readers be interested in, a professional, quality, DIVING TORCH ? May I congratulate you on your Fantastic post.You have made my day and gained a new fan. in comparison to many of the articles on the world wide web this is a rare find, I am glad that I discovered your work. I promise to be linking to this on all my sites. May I congratulate you on your Fantastic work.You have made my day and gained a new fan. Compared to most posts on the web this is a joy to read, I am glad that I discovered your work. I will be linking to this on all my blogs. May I congratulate you on your Excellent article.You have made my day and gained a new reader. in comparison to most posts on the world wide web this is a rare find, I am glad that I came upon your post. I will be linking to this from all my blogs. Hello, thanks for a wonderful article, a really great start for the new year, keep up the wonderful work, Cheryl. Hello there, thank you for this great article, a really great start to the 2010, keep up the fantastic work, Anne.